Gloss-it's Concorso final finish has been a trade secret in the Gloss-it family for the past 10 years. 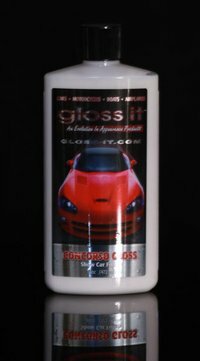 Concorso Gloss has won more Best of Show trophies than any competing Carnauba wax available. Our flagship gloss offers the ultimate in depth, clarity, colour enhancement and brilliance. Concorso Gloss is safe for conventional clear coats, single stage paint, and Nano Ceramics. Body shop safe! Concorso Gloss works excellently both by hand and machine. For unsurpassed results use our Gloss-it Dual Head Orbital Polisher with Gloss-it Blue Foam Finishing Pads. Please visit Gloss-it.com for online instructional videos.